Hello Stockport readers, my name is Lorena. I’m a 21 year old university student who lives in Spain and is here for the holidays. I’m studying to be an infant school teacher, I love photography and vintage so this project was the perfect mix! I hope you like the things I found as much as I did. I’m not a blogger but I tried my best to write a fun and interesting article, hope you enjoy! 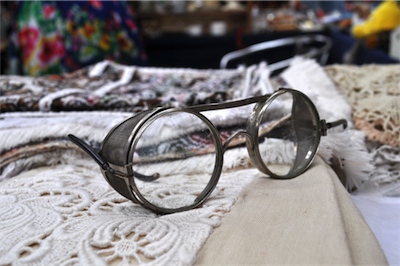 One of the items that caught my eye at the vintage fair were these original 1930s safety goggles used for welding. I found it amazing how the rounded style of these glasses has evolved into the round Clubmaster style that Ray Ban sell nowadays and which are sooo in fashion. If you think about it, this style has been in our lives since forever, not only as sunglasses but also as normal glasses - Jack Nicholson wore some round styled glasses in the 70s film “The King Of Marvin Gardens” and they weren't very different from the ones I found. I’ve discovered that many people who follow the steampunk style buy these old goggles and transform them into Steampunk Side Shield Sunglasses, so there’s a project for you if you’re interested! 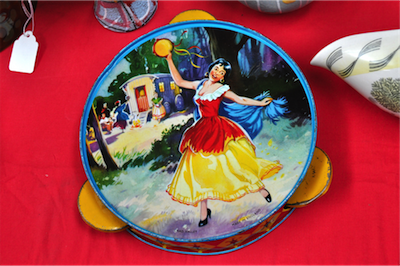 The most noisy find was this lovely tin-plate tambourine made by the ever popular toymaker company Chad Valley, which started in 1860 and is still going to this day! Dating to the late 50s or 60s, this toy was made at the time the company ceased to be a private family business, becoming a public company and having Major Whitehouse as the first Chairman of the new Chad Valley Group. It had some light rust spots and scratches, I mean you could see that it had been happily played with, but I think this just adds to the look! The main part, the painting with the gipsy dancer was in great shape! The colours were shiny and bright and the picture was in perfect condition. 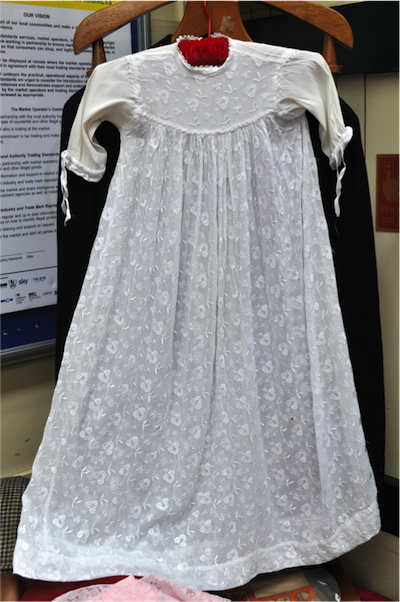 This delicate old fashioned gown belonged to a woman who died at 101! It is beautifully made, the details on it are just incredible and it’s very well kept and in perfect condition. I’m very sorry but I forgot to ask for the price but I’m sure it is a very reasonable and affordable number. This adorable 1940-50s child’s ride was made by ”Lines Bros”. I must say this was the cutest thing I found. I looked for the owner of Retrodecs so that I could get more information about it, but sadly I didn’t find her. 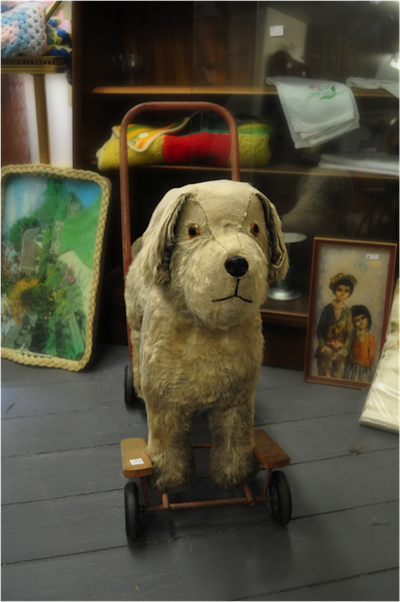 By the wear on its fur this lovely vintage toy was obviously well loved. And who could wonder with a face like that, so cute! Anyway, I loved this pup! 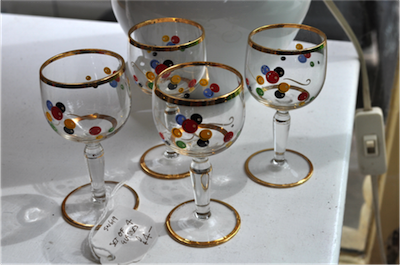 A set of four vintage small brandy snifters cordials with gold rims and coloured spots. They were so dinky and fun to look at that they caught my eye as soon as I walked into the shop! I can just imagine my great gran drinking out of these. Honestly, if I asked for a drink and somebody gave me one of these I would look at them with an “Are you mad?” face. I’d feel like I was in a wild wild west saloon swallowing my drink in one gulp and asking for the next one! That was all for this time, thank you for reading and I really hope you liked it and found stuff of your interest. Thank you to my aunt Fiona for signing me up to do this and to Sarah for helping me through it. Thank YOU Lorena! We've really enjoyed your personal selections from our August fair, and we hope you will make a return visit sometime! Now, what do you think about my beautiful aunt? I’m sure some of you recognise her! Apart from the hat not suiting her at all and looking like an underripe pineapple… she’s pretty, right? 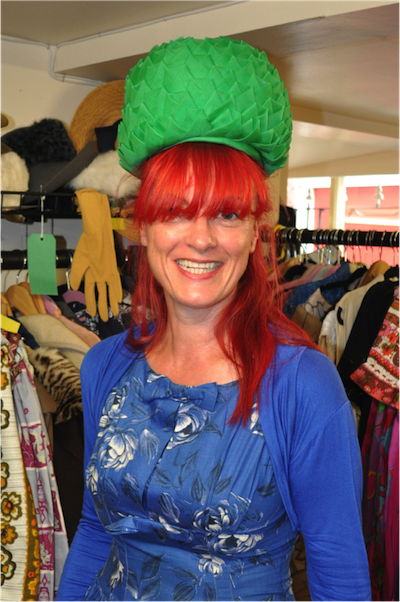 So, the hat... this 1950s green (don’t know how to describe it) hat belongs to Garbo Antiques. Pineapples are in fashion this year and they are very summery so it’s the perfect hat to wear on your beach holidays! I bet you’ll be the most looked at woman in a few miles… Or, you could just wear it to a fancy dress party, who cares? This hat is such fun and you wouldn’t need to take a handbag with you, you can just keep everything in your hat! It’s just perfect. [Editor's note: aunt Fiona was our Finder in April]. 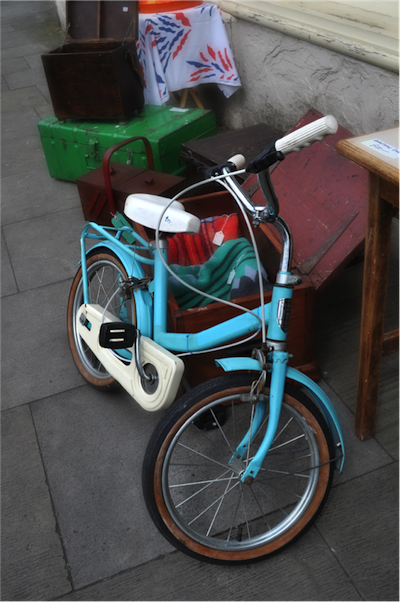 This 1960s Charles bike is in excellent condition for any child, I would have loved to have had one like this when I was a kid, not now because I don’t really ride bikes but as a kid… I would have been the envy of my friends! At the moment it’s at the 20th Century Store and belongs to Snygg, but it can be sleeping in your garage for just £35.00! Now, that is a bargain and the child you give it to will absolutely love you! I’m sure you won’t find a better present for that price, plus you will be creating a future vintage fair lover and buyer! All that for £35.00? Where should I sign? This beautiful piece was made by a young lady named Stacey who recycles old furniture and renovates it into gorgeous artwork. Stacey is a school teacher and she does this as a hobby in her summer holidays. What she does is découpage, I’ll explain what this is just in case you’re not sure, basically it’s decorating a piece of furniture by glueing different pieces of paper onto it and then sealing the result with varnish. It sound easy but it takes a long time to do! 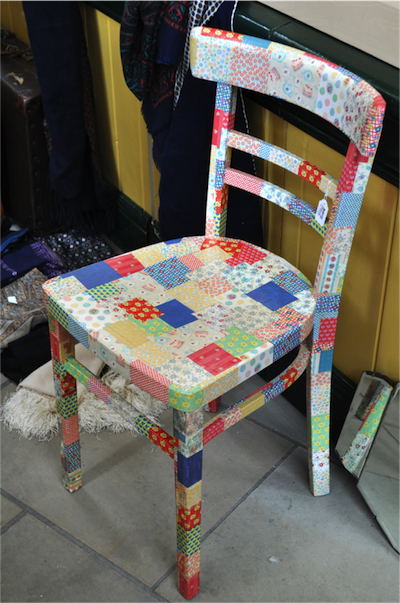 This amazing chair was only £17.00! By the time I got there it was already sold! But it’s not surprising really, taking into account how good it would look in any home. If you love this chair as much as I did, you can go to Stacey’s ShopRetro blog where you will find some of her projects, they are all incredible! I fell in love with this dress as soon as I saw it! 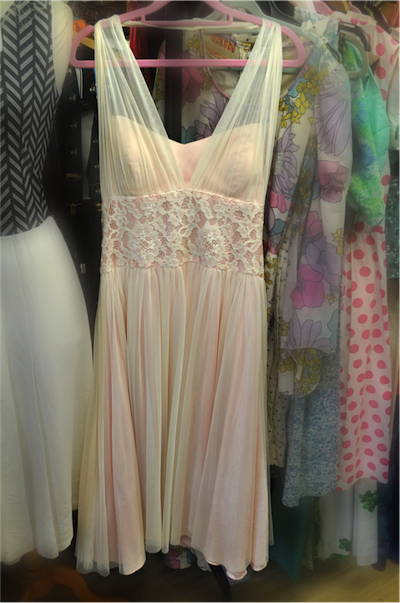 It’s a Betsy & Adam 1970s pale pink halter neck dress, just beautiful! When Marilyn Monroe’s films came out, everybody went mad about this style and after seeing this dress I can understand why every girl wanted a dress like Marilyn’s! I wanted one also! You are lucky it’s a size 14, which is too big for me, so you can still find it at Garbo's unit at 20th Century Stores. I’m sure it will look amazing on any of you girls, so go and get it now! I wonder where this dress has been… It was found in France so it’s probably been to the top of the Eiffel Tower with a very handsome young man, just like in a Marilyn Monroe film.